United welcome back Craig Easton to the starting line-up after the player served the second of his two-match bans against Dundee last week. Also earning a starting jersey is Jim Paterson, who was so impressive when he came on as a substitute in the League opener. The match is only seconds old when the referee has to halt play to allow treatment to be given to Partridge. United quickly move up the park and Lilley tries his luck from 25 yards, but his shot is straight at the ‘keeper. United are playing much better than their opponents in these early stages, with some superb backing from the travelling fans. Partridge does very well to keep pace with Twaddle and makes a timely challenge to prevent a dangerous situation for United in 8 minutes. United are fortunate not to be a goal behind in 16 minutes when Twaddle’s fierce shot is only inches away from Gallacher’s right hand post. United escape again in 19 minutes when a goal seems certain from a scramble in the six-yard box. 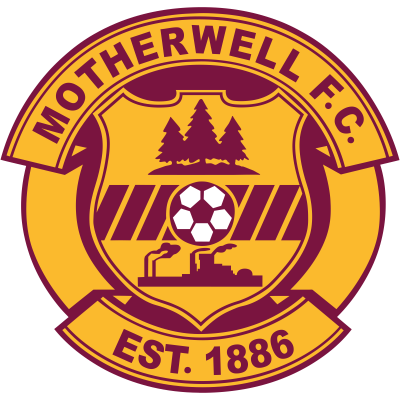 This is Motherwell’s first period of sustained pressure and United are doing well to keep the Steelmen at bay. In 22 minutes, the impressive Jamie McCunnie fires in a tremendous shot from 25 yards, only to see it tipped over the bar by Brown. United bring pressure upon themselves in 34 minutes when Twaddle is allowed to deliver a dangerous cross from the right. Some desperate defending ensues with the ball being hacked away to safety and out for a corner. United have lost their grip on the game and Motherwell are piling forward at every opportunity. Partridge earns the first yellow card of the afternoon in 41 minutes for persistent fouling. The second yellow card follows seconds later when Motherwell’s Ready falls foul of the referee. The game explodes just before half time when a dangerous lunge from Tarrant on McCunnie starts an on-field brawl with just about every player on the pitch involved. 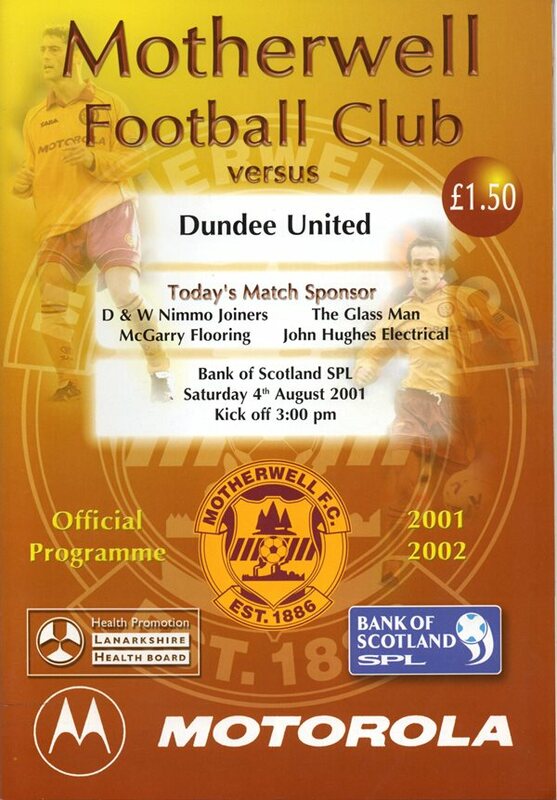 The outcome is that only two players were booked – McIntyre for United and Tarrant for Motherwell. United started well but seemed to fade during the course of the half allowing Motherwell to settle. Overall United will be happy to get to half time still level. Both managers will no doubt be having some strong words for their players about keeping their discipline. Passions are running high and there is no shortage of meaty challenges going in from either side. Neither side makes any changes at the break. United re-start the match attacking the goal their supporters are seated behind. Strong running from Lilley takes him into the box with a scoring opportunity. However, a well-timed tackle prevents him from doing so. Two minutes into the half and United make their first substitution bringing on Buchan for Partridge. Some fast, attacking and positive play by United creates a scoring chance, but Paterson’s final effort crashes off the bar and out to safety. Miller is now making his mark in this match, managing to play more accurate passes than he did in the first half. United go so close to scoring yet again as Lilley’s effort canons off of the post. In 63 minutes United swap Paterson for Hamilton. One minute later McIntyre tests the ‘keeper with his powerful header but Brown is equal to it and saves well. United are much the better team at this stage and are working hard for each other, spraying passes around in what is attractive flowing football. Danny Griffin leads by example again in 73 minutes when he bursts down the left to deliver a pacey and dangerous cross, only for it to be cleared for a corner. United are doing everything they can to find that elusive first goal. Crosses are coming in from both flanks and, with a noisy support behind them, look the likelier side to score. With ten minutes remaining, United use their final substitution bringing on Thompson for Lilley. With four minutes remaining, United concede a soft free kick on the left. Hartley’s delivery into the area is good and United do well to clear. Motherwell’s best period of the half comes at the end of the match to ensure some nervy moments. The final whistle sounds and United’s players and fans warmly applaud each other.